Dr. Randy White, Executive Director, introduced this program in 1995. Dr. White, pastor of Trinity Baptist Church at the time, made a special presentation to Gwen Yeager and David Sessoms from the Fayetteville Police Department. Rev. White said “They counsel children who have been abused. This program is called the “We Care Bear Program” and each child is given a bear to cuddle and take home with them.” He brought the program to New South River Baptist Association as the new Executive Director in August 2002. 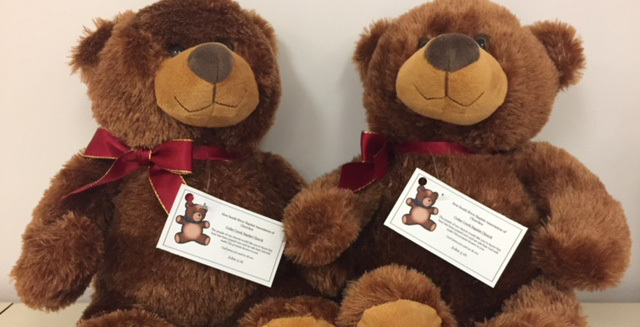 The churches of the association bring new, 7” to 12” tall, bears to the association’s office. The bears are then tagged with the church name that provided them, along with the John 3:16 Bible verse. To date, over 20,000 bears have been distributed to organizations and these bears have impacted more than just children in Cumberland, Sampson, and Hoke counties in such places as the Police Departments, Rescue Squads, Highway Patrols, Hospitals, Nursing Homes, Assisted Living Homes, Fire Departments, Autism Society, Ronald McDonald Houses, Foster Parent Appreciation Events, etc.